I won a copy of this book from Jennifer @ Snapshot some time ago (and can't find the original link back to her post!) and completed my reading of it this past week. I opened the cover and dove right in, without researching it or knowing anything about the authors. As I began reading I was thinking to myself, "Wow, this sounds like an enthused sermon leading up to a good old fashioned alter call!" Lo and behold, it is written by two pastors and I think that was their intent. At least, to some extent. It certainly delves beyond the subject of becoming a Christian and entering into the power of the resurrection. But still, it is just that. I felt like this book was better written for brand new Christians or those who are considering taking the leap. It is a remarkable book for one who is beginning their journey and I would (rather strongly) recommend it to anyone in such a situation. It is informative and encouraging -- which is exactly what is called for under such circumstances. If you know of someone in that situation - who is stepping into this brand new world in Christ then by all means gift them with this book. It would be fantastic. 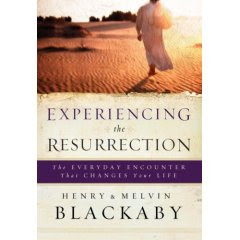 What this book is not, is a guide for a long standing Christian who wishes to know MORE of the power of the resurrection. It is an appropriate beginning book any which way I could possibly view it and a useful tool. It is also a good reminder when you need one. It just is not a "let's go even deeper" sort of book. They address the questions that should be plaguing any Christian -- "Why not more?" Especially when we know that more is to be had. Experiencing the Resurrection caused me to ask good questions of myself. It made me aware of an excellent tool that can be given to those who are just starting out. It made me think about the power that is contained (and not contained!) in the resurrection of Jesus Christ. It is earth shattering material in and of itself. It is good. And I recommend it. Just keep reading. 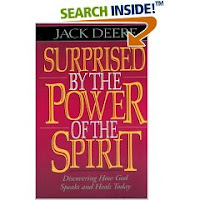 One book I would heartily recommend which speaks of this power is Surprised by the Power of the Spirit, by Jack Deere I think that this is more or less what I was expecting from Experiencing the Resurrection. So I think the problem was with my expectation going in. But still - a good book and I'm glad to know of it. I never saw this post, but what struck me about this book is that it's also inspiring for those many many people who DO believe, but haven't appropriated the power (either by not submitting or by not fully obeying).